Violet achieves Omni-directionality by the use of a specially designed diffuser on top of the radiating speaker. So instead of sending out a narrow beam of sound, it sends out a field of sound in all directions and creates a sound space around itself. As a result you can sit anywhere in the room and you will be enveloped by sound as it is intended to sound, with zero loss. 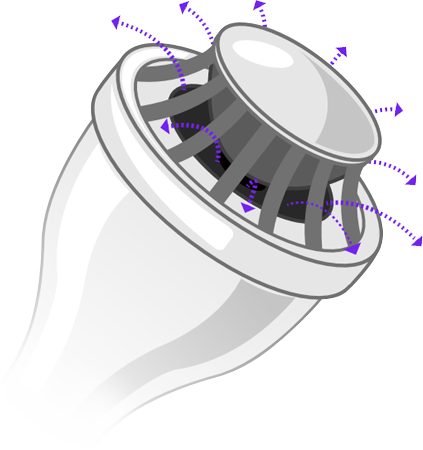 Most conventional speakers emit sound like a focused beam of light from a torchlight. In an anechoic room, the dispersion of the speaker would be irrelevant but will only be wide enough to cover the listening area. Conventional speakers are great for a single listener, fixed in one spot and listening in an anechoic room. Humans are used to hearing the reflections in the rooms. In fact, we have an acute but subconscious understanding of the acoustics of the space we are in. However, we don’t live in anechoic rooms. One way to come closer to the ideal is to treat the room. However, room treatment only helps the room’s contribution to the problem, but the speakers still send focused sound only to one spot. We need to be immersed in sound no matter where we sit in our living room. For the widest listening area omnidirectional speakers provide the best spectral balance and room filling effect. The music emanates from a space beyond the speakers. a speaker and an amplifier.It is well proven science that fidelity alone is not sufficient to describe the quality of sound that human beings experience. In addition to fidelity, we are very sensitive to the timing of each sound. One example of our sensitivity to timing is the experience of rhythm in music. In addition to the fidelity of sound coming out of each speaker, the timing of this sound plays a very important role in how we experience sound and space.When all speakers play with perfect timing, similar to various instruments in a orchestra, it becomes symphony, which we call coherence. Coherence becomes much more important when watching a movie or a live recording. Typical studio recorded music is experienced on two channel sound, where the effect being created is that of a stage in front with the musicians performing. But in a movie or a live concert, many times, the director wants to place you in the middle of the action. The music director uses ambient sounds to create an atmosphere or mood by accurate timing of each musical sound. And the sound engineer codes the sound so that this can be replicated in your home. 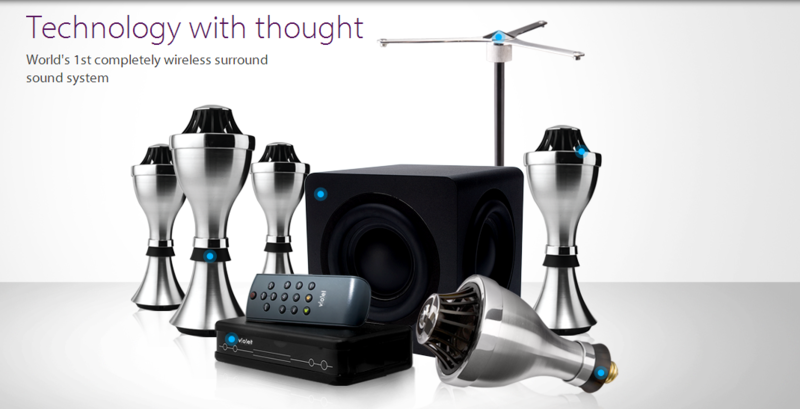 Surround sound is created by placing multiple speakers in one room. The interaction of sound coming from these speakers defines your listening experience at various points in the room. You enjoy the sound in a good movie theater or concert hall because the acoustic engineers have aligned the various sounds to create this effect. However, speakers in a conventional home theater are unaware of presence of any other speakers and produce sound independent of each other. The space in which the sound get aligned, if at all, is very narrow. There is a discord in your living room. This problem becomes increasingly severe as the number of drivers (individual speakers) inside one speaker increases (aka, 2- Way, 3-Way, etc). Each driver produces different sounds at different time and can only be aligned at the so-called ‘axis’ of the speaker. First of all, Violet uses a single driver in each speaker which is by design coherent in time and space. Secondly, Violet can precisely estimate the acoustical characteristics of the sound in various parts of the room using its space sensing microphone technology. It also uses a very high speed digital signal processor and a phase (time) accurate wireless technology which allows for precise control of timing of each signal coming out of the speakers. The system dynamically optimizes the sound in a room, in a manner similar to designing a good movie theater, to give you a coherent sound in any space. Running wires from amplifiers to speakers is a huge problem. First, you require an expensive high quality speaker wire because it has two key properties – it has low interference and delivers the signal to speakers with the same precision. Second, it is time consuming to run the wires across the room. Third, it affects the aesthetics of your room. Fourth, you cannot place speakers precisely where they need to be. Fifth, you cannot move your speakers once they are installed. Violet is completely wireless from the base-station to the speakers. Speakers only need to be connected to the power source. Wireless audio was not possible in surround sound systems until now because surround sound speakers require interference-free wireless and accurate synchronization of various wireless nodes with each other – both of which were not possible until now. Running wires to speakers is a huge problem. A high quality wire is required to get great sound because of has two key properties – it allows for low interference during signal transmission and it delivers the signal at the same time to all speakers. Violet is a completely wireless system where you can screw in the speaker into a light bulb or you can plug it into the nearest power outlet. 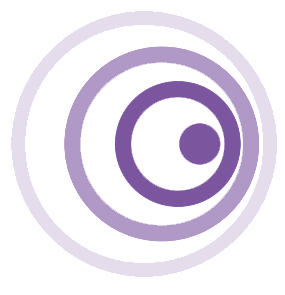 Violet tackles the problem of interference using its unique Power Adaptive Technology. Unlike typical wireless systems, which beam out the sound signal for the speakers to catch, Violet knows where the speakers are placed and hence sends the sound signal using the minimum power necessary to avoid interference. Violet also dynamically adapts this power to the surrounding conditions giving you the perfect quality digital signal.